Craveworthy. Why make your own, it is already in this bottle. 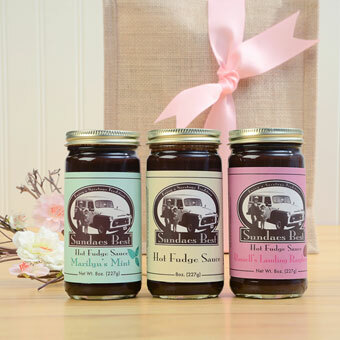 Sundae's Best, located in the picturesque hills overlooking Saratoga Springs, New York, crafts decadent hot fudge sauces from wholesome milk, cream and sweet butter from a local dairy. For over 40 years, this family-run company has been satisfying the sweet cravings of Saratogians in the know. Our love of fudge and an inability to choose just one favorite flavor was the inspiration behind Sundae's Best Bag, featuring one jar each of Original, Raspberry and Chocolate Mint Fudge sauce. Nested in our jute tote and tied with a festive ribbon, this is a lovely (and tasty) way to share a favorite Saratoga tradition with friends and family. Sundae's Best - Original Hot Fudge Sauce: From a family recipe that combines premium, mouth-watering semi-sweet chocolate, with the highest quality cocoa, pure cane sugar, award-winning NY State Stewarts® milk and sweet Cabot ® butter. Sundae's Best - Russell's Landing Raspberry Hot Fudge Sauce: A perfect combination of sweet and berries. Sundae's Best - Marilyn's Mint Hot Fudge Sauce: A rich creamy base of chocolate hot fudge sauce is infused with the perfect hint of mint. Delightful on chocolate ice cream, and makes a cozy cup of hot chocolate.